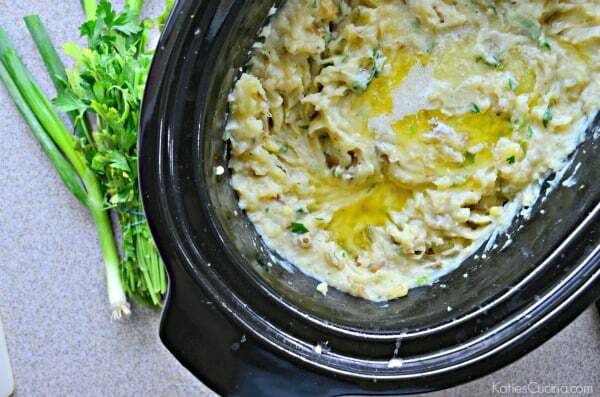 Learn how to make the most delicious mashed potatoes using your slow cooker! This recipe is fail proof and only takes 4.5 hours from start to finish! How is Thanksgiving just a few days away. This year has officially flow by (like all the others). We are now in the heart of holiday season. I’m excited to share with you my latest slow cooker recipe. 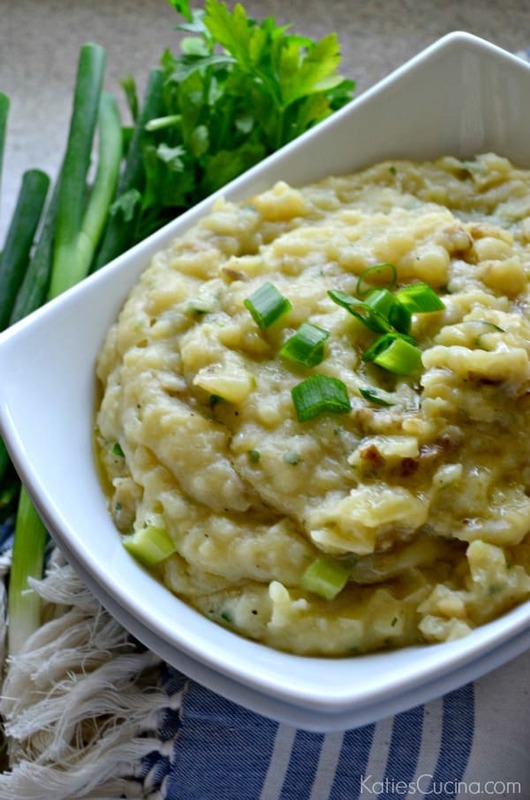 Did you know you could make creamy flavorful mashed potatoes in the slow cooker? Yep. Totally works and your guest will never know that you made your mashed potatoes in the slow cooker. From as long as I could remember my mom always made mashed potatoes from scratch. Never ever from a box or package. Each Thanksgiving, we have family from all over the United States gather at our home for the feast of the year. A large group equals pounds and pounds of mashed potatoes! We make anywhere from 5-10 pounds for dinner. Do we eat all 10lbs at Thanksgiving dinner? No! We make a bunch so that we have enough for leftovers. I turn a few cups into mashed potato soup or even my potato and turkey corn chowder. This year my parents are hosting Thanksgiving dinner. My husband and I have hosted the past few years. My mom is already stressing on how she will not only cook but house all this food. That’s when I started brainstorming and thought to myself… Why can’t we cook the mashed potatoes in the slow cooker? That would free up one valuable burner. So I’ve been testing over the past few months. Like every other week making 5lbs of mashed potatoes in my slow cooker. This is when meal planning is key so you can work the potatoes into multiple meals a week. The sky is the limit as to toppings. You’ll use the same cooking method each time except change up the toppings once your ready to mash. And don’t forget to reserve a little bit of the fresh add-ins to top your potatoes. Here are a few ideas of toppings: crumbled bacon, cheddar cheese, feta, fresh herbs like parsley, dill, and green onions. I typically stick with lots of butter and fresh herbs. And if you don’t want the pungent garlic flavor you can remove the cloves before mashing or omit them completely. And you can mash these potatoes right in the slow cooker. Making this the ideal side dish since it’s one thing to wash. I also serve the potatoes right in the slow cooker! Why dirty additional dishes? So if your feeding a big crowd or simply looking to help simplify dinner this recipe for slow cooker mashed potatoes is the recipe for you! 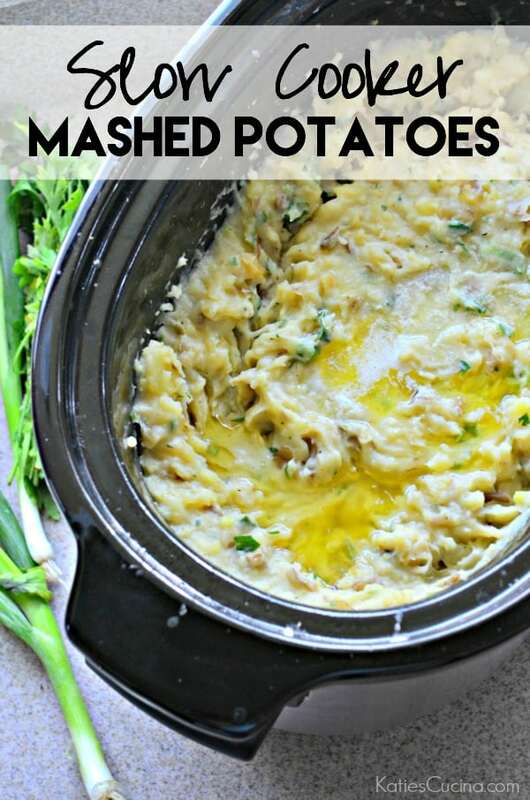 mmmm mashed potatoes are one of my faves and I love how easy it is to just make them in the slow cooker! Mine too! I could eat bowl fulls (with lots of gravy)!! !